HuffPost, in partnership with Urban Dreams, turns the tables for a night and features people of the Des Moines community in conversation with Urban Dreams’ Wayne Ford about the challenges they face today in Des Moines. Community leaders and elected officials will join the public in the audience. The event will begin at 7 p.m. (doors at 6:30 p.m.) and is free and open to the public. The event is part of HuffPost’s “Listen to America” bus tour—a 25-city tour devoted to listening to the concerns of people across the country. IowaWatch is the Iowa news partner for a cross-country tour by HuffPost that will stop in Des Moines, Iowa on Oct. 9, 2017. The goal of HuffPost’s “Listen to America” tour is to engage in conversations with people across the country of all ages and backgrounds. HuffPost will interview people in a mobile video studio about their hopes, dreams, fears and definition of “being American.” Their goal: moving, multimedia storytelling that showcases what we share as Americans, rather than what divides us. The HuffPost tour bus will park at the intersection of Sixth and Forest avenues, across from Urban Dreams, from 11 a.m. to 3 p.m. Food trucks will be present during lunchtime. Also, a panel forum is scheduled at the Sussman Theater in Drake University’s Olmsted Center from 7 to 9 p.m.
IowaWatch and HuffPost are collaborating on an upcoming news story by veteran Iowa journalist Cindy Hadish about a topic that is important to Iowans. 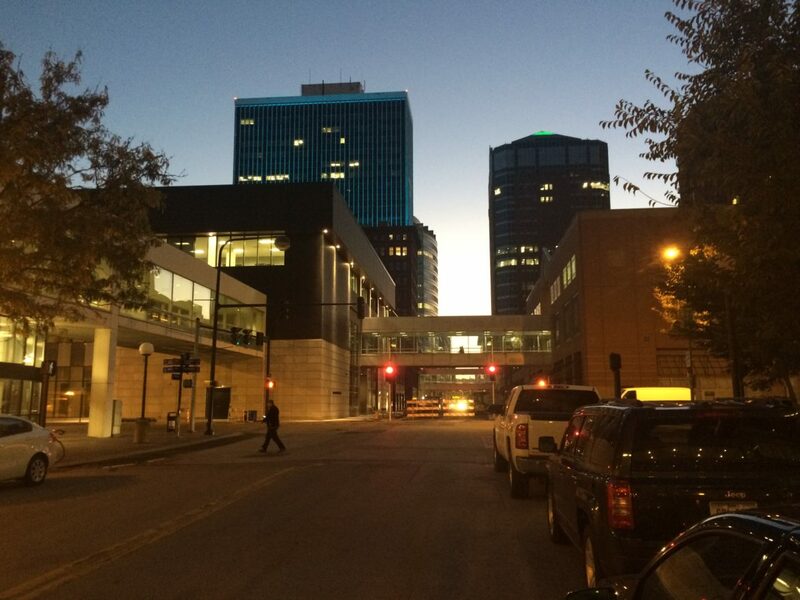 The story will be published in conjunction with the HuffPost stop in Des Moines. Muller also said the IowaWatch team is happy that HuffPost is working with experienced Iowa journalists to tell a story. The “Listen to America” tour will stop in 25 cities between Sep. 12 and Oct. 30, 2017. HuffPost journalists will travel in a mobile studio in a tour bus gathering stories from several states about what it means to be an American in 2017. The Iowa Center for Public Affairs Journalism is an independent, nonprofit, nonpartisan, investigative news service that does investigative and community affairs journalism in collaboration with other media and trains college student journalists to do this kind of reporting at a high level. 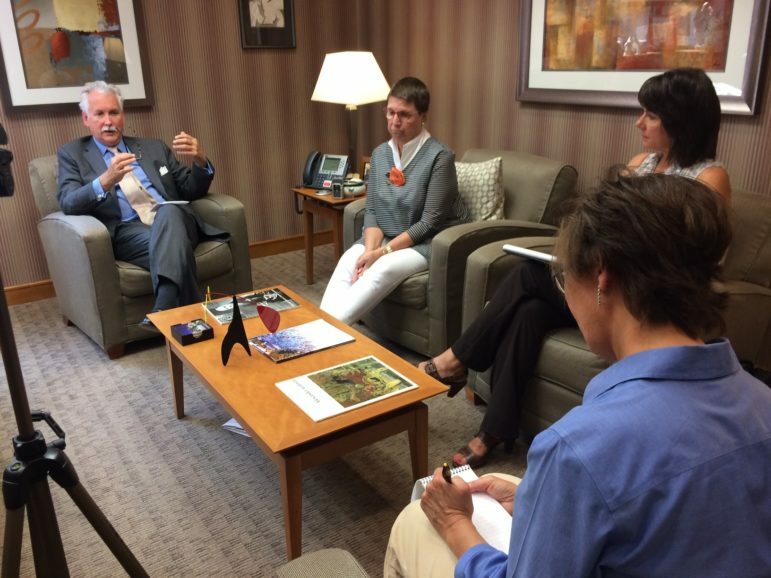 Mercy Medical Center president and CEO Tim Charles speaks at his office in Cedar Rapids while Kathy Good (center), director of Mercy’s Family Caregiver Center and Karen Vander Sanden, the hospital’s PR and media specialist, listen during an interview by freelance reporter Cindy Hadish on Aug. 10, 2017. Good’s husband, David Good, died of Alzheimer’s disease in 2015.